Blue Pepper is a great choice for parties of up to 10 guests to enjoy the Virgin Islands in style and comfort. 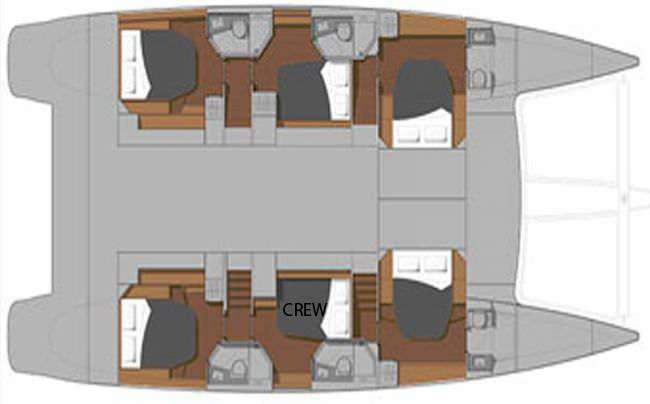 The crewed catamaran offers five guest cabins, each with a queen size berth, en-suite bath with stall shower, electric fresh water flush toilet and vanity. Each guest cabin has an individual control for the air conditioning to ensure your comfort. There is a very spacious salon, large aft deck for lounging and alfresco dining, and a lovely top fly-bridge offering a 360-degree view of paradise and is fully shaded with awning for your comfort. Contact us for rates and current availability or to book a charter aboard Blue Pepper! Other Blue Pepper is equipped with a full medical kit, oxygen, as well as an automated external defibrillator. Bangers & Mash England recipe, gratin mash potato, covered in a dark gravy, topped with sautéed onions, tomatoes, and sunny side up eggs accompanied by spicy sausage, sweet sausage and gammon bacon skewer. The crew, Taylor and Denise were friendly, knowledgeable, attentive and accommodating during the trip. Yacht Blue Pepper was very comfortable, clean and well ventilated, I really liked layout of the cabins and their comfort. Food was great! The chef customized the menu to our preferences 100%! Everybody loved the itinerary of the area that we sailed. Hope to be back next year and sail with the same great CREW aboard Blue Pepper.